If you want to achieve your business goals with user-friendly and effective applications, you need to find a software development team that can create high-end and visually appealing solutions that users will love. To do that, you need a whole range of specialists from UX/UI designer and software developers to project managers, business analysts, QA testers and financial experts. All of these specialists are available in top custom software development companies like Zaven. You only need to find the best partner to work with. At the beginning of every IT project, a software team should work closely with its client to define the client’s requirements and to estimate costs. This process will help everyone to work cost-effectively in the future, plan tasks and improves communication. “The cost of a mobile or web application depends on a number of factors like required functions and additional custom features and technologies that are to be used in the project.” – Piotr Hyrczak, Co-Founder at Zaven. For example, the price for an MVP will be different than a single-use promo app. Software development companies often use the Time & Materials financial model because it benefits both sides. On the one hand: better time and cost control for the client, plus the possibility to pay in convenient installments. On the other hand, this model offers a stable workflow for the team. Software development companies normally sign an NDA and a financial contract that precisely spells out all the details, conditions and arrangements. Sometimes, an IP-contract is also signed to govern copyright transfers as stages of a project are completed. 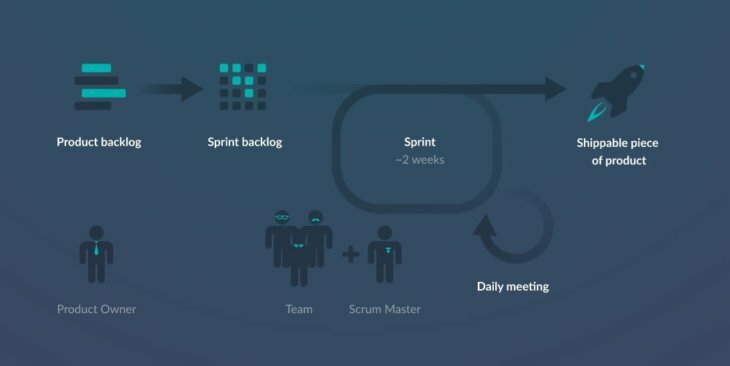 A lot of software houses work using the SCRUM Agile methodology, which is based on the best practices used in software development. What is the greatest advantage of developing mobile or web software for the client in this way? The process is transparent: the project owner (client) has access to issue-tracking tools which allow for the supervision of the work being done. Moreover, the client receives progress reports on a regular basis and can modify their requirements at determined points. Thanks to that, the project can be overseen every step of the way during its IT outsourcing process. The effective teamwork of all these highly qualified experts during the various stages of a project, guarantee excellent quality for the software. “We use diverse testing methods because we know how important it is for the product to be user-friendly and rigid. This helps us to create an impressive design and high-class code.” – Konrad Mielczarek, Software Tester at Zaven. When making a checklist for “how to choose a software development company”, code transparency cannot be missed out. Every software house should care about the code. It should be clear, transparent and well-documented, enabling the client to continue mobile or web development projects without any problem. Check if the software development company provides after-sales services and supports applications in terms of IT and design. Effective communication is one of the most important factors during the software development process. Ensure that the software development company has English-speaking employees and can communicate with you via phone, email, Skype or live chat (as you prefer). “First, we always arrange online or off-line meetings, during which we work out all project details and stages. Secondly, there is always an English-speaking manager available for the client at every step of the project. Furthermore, the vast majority of our programmers know English so they can communicate with the client directly.” – Paulina Zygler, Zaven Project Manager. We hope that now it will be easier to find a great software team to cooperate with and turn your business idea into a profitable web or mobile application! There are a lot of software development company lists that you can check too. For more information see also our “Before Choosing a Software Outsourcing Partner” series. Afterwards, explore real data so you can decide which software development company is the best choice for you.